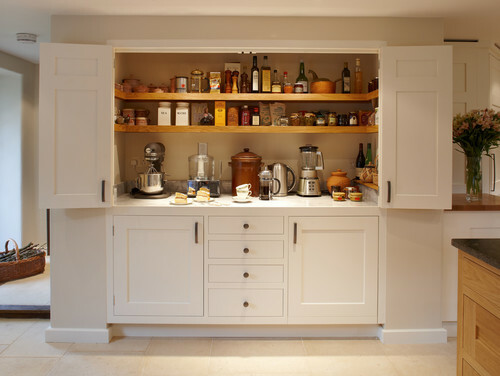 Function and efficiency are so important in kitchen design, especially when working with a small space. 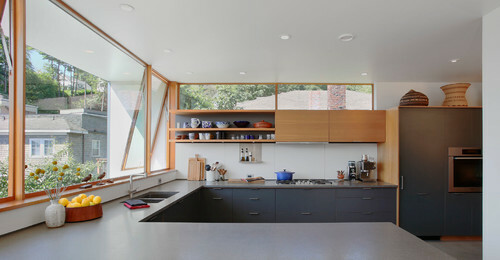 Here are some of my favorite solutions for kitchens that I have seen lately. My favorite solution for mixers, toasters and coffee makers. 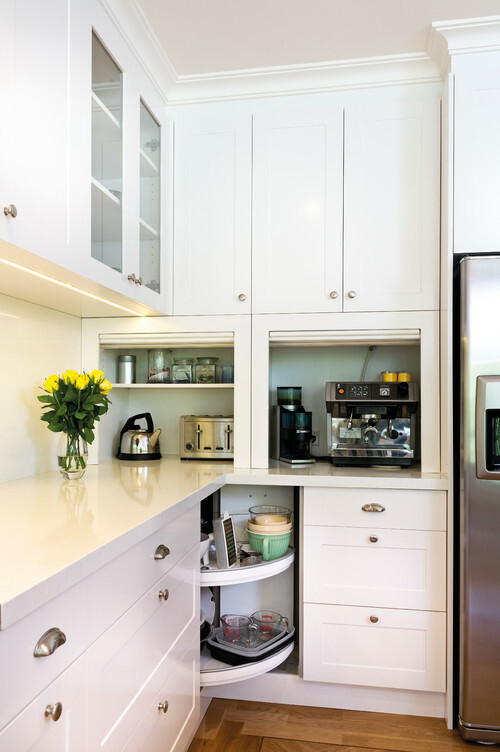 This makes your cabinet space into a workhorse utilizing all the storage it has to offer. My second favorite solution to kitchen appliances. Bonus feature: having an outlet in the cabinet so that appliances can stay plugged in. Just leave them right where they are or slide them out slightly to use, then push them back in when you are done. Close the door, and presto! All clean. We no longer need to waste space or reach into the depths of the corner cabinet. I've seen so many creative solutions to solve this age-old problem, from innovative lazy susans (above) to door-drawer combos. I'm excited to see what they come up with next! When your kitchen cabinets don't reach the ceiling it can be difficult to know how to decorate above them. Leave it blank? Add a collection? A clearstory window is the perfect solution. What better way to decorate than with a view? The trend towards having drawers in the base cabinet instead of the traditional door is efficient and convenient. 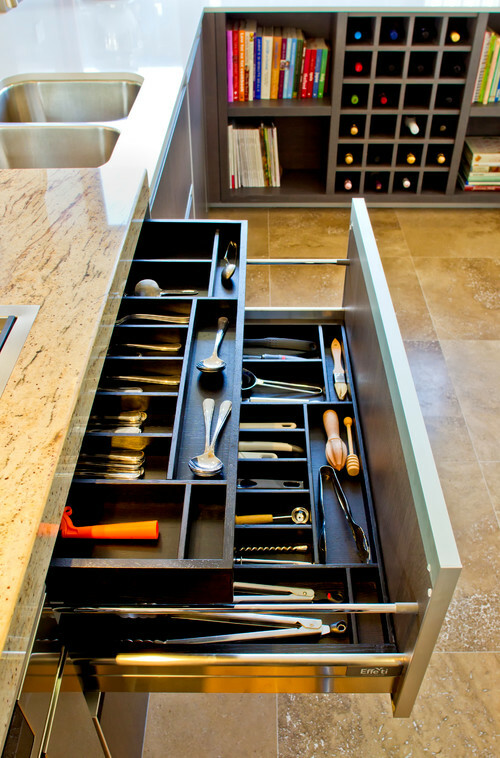 Plus the opportunities to get creative with the storage inside of each drawer is endless. 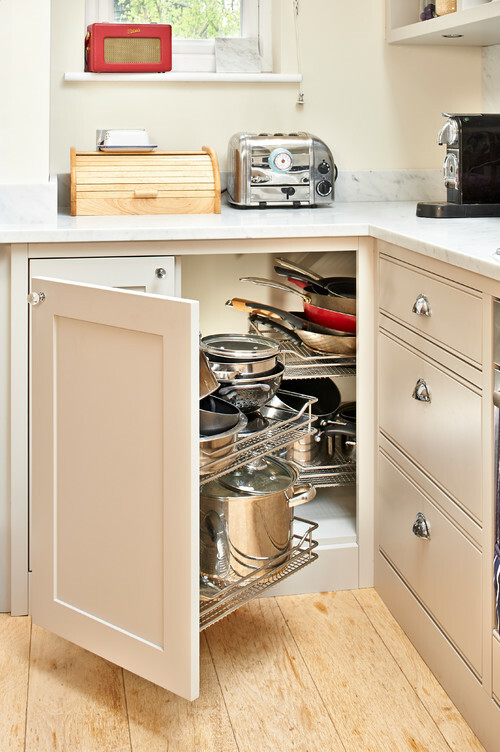 This solution is a favorite of mine because the drawer fronts will stay consistent from the outside, but you can stack the storage drawers on the inside. The National Kitchen and Bath Show in Las Vegas wrapped up yesterday. Can't wait to see all the great solutions and concepts that will surely be popping up now! My parents recently finished remodeling their home. They stayed put through the construction and are so relieved to be done and now have a beautiful and more functional result. One of their dilemmas was two windows in their living room area. Both needed privacy while still allowing adequate sunlight, and one receives too much sunlight in the summer making it very warm inside. So when I was contacted by Cellular Window Shades based in Vermont I was excited for this solution to our design problem. We measured the windows and ordered their Top Down Bottom Up Single Cell Shades. The shades (made in the US, woot!) arrived quickly and they were a breeze to install. What I love about this particular model is that it can not only roll up from the bottom, but also roll down from the top. This allows for more light and outdoor views while still providing privacy. These shade are a really great value. I know that it will make their home more energy efficient in the hot summer months. Even the contractor made comments about how impressed he was with them! Thank you to Cellular Window Shades for providing these shades for our review!